Is there any way to change the web app reloading screen? I want it to display something else. Also if you can, can you change the web app error page? Which reloading screen do you mean? You should just get a normal browser loading page when the website is reloading. Regarding the error page, making that customizable is on our to-do list, and I've added an upvote on your behalf. 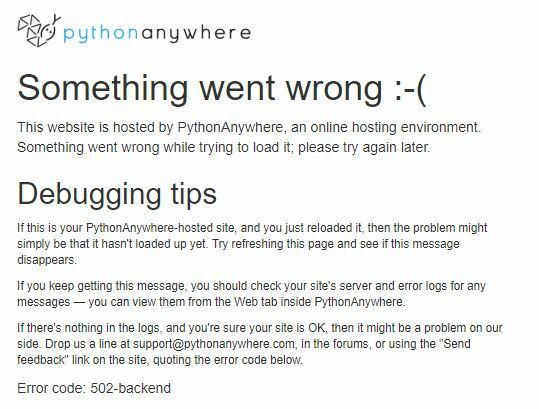 That said, the PythonAnywhere error page should only appear if there's a serious problem with your code -- normal internal server errors will be handled by your web framework, and it will provide a way for you to customize them. I mean the 502 application reloading webpage. Could you provide a screenshot? It is not normal to get a 502 application reloading webpage when you reload. Does your website take a long time to start up -- say, by making external requests or by loading lots of data into memory? For normal websites that start up in a couple of seconds, you won't get that error page, but if your site takes more than (say) ten seconds then you'll get that error page while it's loading. Right, but the size of your database shouldn't affect the startup time for the site. The Django app that handles the PythonAnywhere user interface itself is tens of GiB in size, but the site starts up in less than a second when we restart it.